This 8-page brief was excerpted from a Reading Research Quarterly article by Hutchison et al. Provide students opportunities to participate in online activities in which they provide information or create content. Provide students with social media experience in school settings. Begin instruction in Internet navigation, reading, and writing in earlier grades. Help students become informed and critical consumers of online images and videos. Encourage girls to see themselves as more capable technology users. 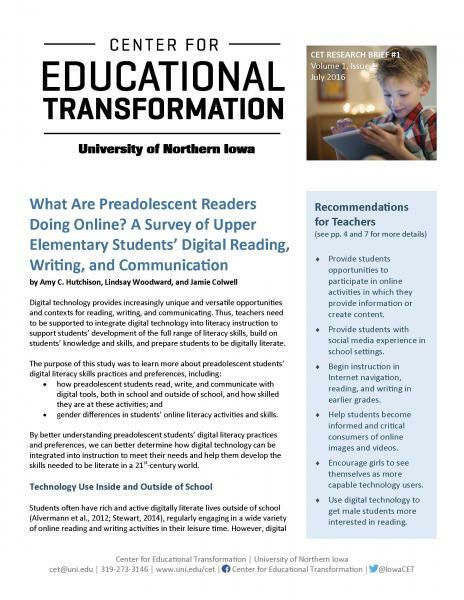 Use digital technology to get male students more interested in reading. This 6-page brief reports findings from Boesdorfer's 2013-15 CET-sponsored study. Teachers view engineering positively, but likely have a naive view of it, assuming it is more similar to science than it is. 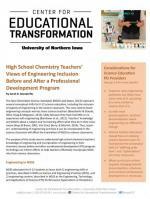 As with most preconceptions, teachers' preconceptions about engineering are difficult to change. Science teacher educators should focus on helping science teachers learn to incorporate the processes/skills of "defining problems" and "optimization" into their classrooms. When curriculum reform requires changing teacher preconceptions, intensive and sustained professional development is necessary.